Apple crumble is one of my favorite desserts around this time of year. 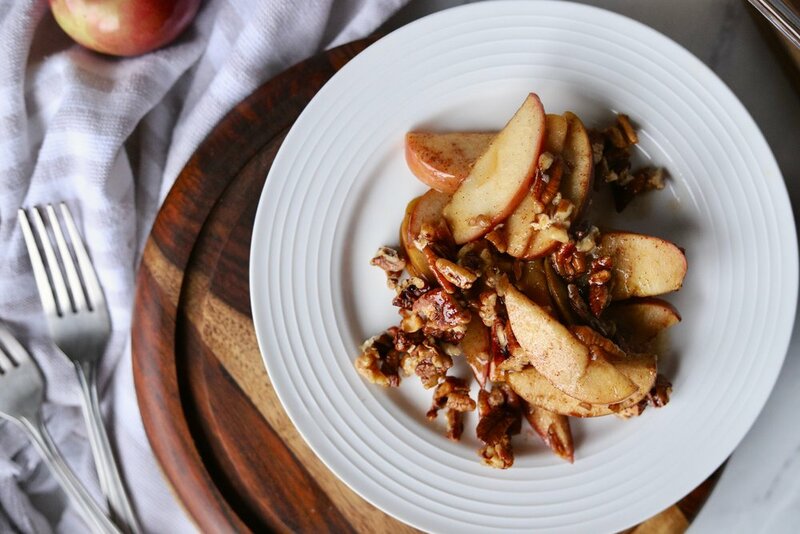 I can't think of anything better than warming up with a bowl of soft and sweet apples, baked under a layer of crunchy cinnamon crumble. Thanksgiving is right around the corner, and coming up with a delicious dessert is high on my priority list! I'm the kind of gal that can skip mashed potatoes all together and go right for the sweet potato casserole, forget the green beans and head straight for the dessert table. It brings me back to being that young and naive child that knows nothing other than what she likes; choices based on cravings, flavor, and the known fact in every young girl's mind - you have a second stomach just for dessert. Don't get me wrong, I enjoy plenty of desserts on a non-holiday basis. In fact, I can't remember the last time I didn't have some kind of dessert or sweet treat after dinner. If you're thinking how and why considering everyone on the internet will tell you that sugar is the ultimate health inhibitor, I can understand. I do agree that loads of processed sugar in the diet can be very detrimental to your overall health and wellbeing; I cannot argue with that. However, sugar is simply one aspect of the big picture. While that might be a topic for another post, I will say this: If you regularly choose fruits and vegetables, if you dine on high quality proteins such as eggs and fresh fish, and if you primarily choose wholesome foods in their most natural state - a serving or two of sugar every now and then, will do the body no harm. Call it balance, call it flexibility, call it moderation, call it whatever you would like. If your daily diet consists of all of the above, there is nothing wrong with enjoying something sweet, something salty, or something deep fried from time to time. The holidays don't have to be your excuse, your exception, or your reason to indulge in something that you enjoy. When we treat a day as our only chance to give our bodies something that makes us happy, we create anxious thoughts, fear, and disconnect with food itself. We tend to over-indulge, eat until we feel like we're ready to explode, and of course - feel terribly guilty afterwards. I have two solutions: practice moderation daily or weekly, and learn how to create healthier options to your sweet tooth favorites. That's how you will win your war with food, that's how you will find peace in enjoying the "unhealthy" stuff, and that's how you will find what works for you. Practicing moderation every day or perhaps every week will allow you to honor your cravings, and reduce your fear of your only day to have something you want. If you are craving something sweet after dinner, have a scoop of that ice cream and stick to the serving size. If you restrict or resist your craving, you might find yourself with the entire tub later that evening. It's all about cause and effect; when you tell yourself no or that you can't have something, the effect will be much more dramatic such as binging, consuming 2,000+ calories, and feeling awful. If you give yourself a serving, sit down and thoroughly enjoy what you're eating, the effect will be much less. You will satisfy your craving, you will let go of the animosity and fear, and your body will happily digest the extra +/-200 calories. That's a huge difference. Along with moderation, you can learn how to choose healthier options. This happens to be my favorite. It's kind of a no brainer when you really think about it: Would you rather consume food that has been stripped of any nutrient value and benefit, or would you rather consume food that has vitamins, minerals and contribute to the body? When you think about sugar in these two categories, I think the answer becomes clear. I think we all share the desire to consume foods rich in vitamins and minerals, and can benefit and contribute to your overall health. That's why we don't need to eliminate and fear all sugars. By choosing a better for you option, you are making a healthy decision. This might mean replacing defined sugars such as table sugar, cane sugar, or brown sugar with honey, maple syrup, coconut sugar, or agave nectar. Choosing fresh fruits over fruit juice, choosing fresh fruit over fruit smoothies, and fresh whole fruits over canned or packaged fruit. Instead of ignoring, restricting, and feeling guilty about my pesky sweet tooth, I choose to use both solutions: enjoy it in moderation and find a healthier option. That's what this apple crumble is all about. It is sweet, it is indulgent, and it is a classic holiday favorite - but it consists of real fruit, sweetness from the earth, and zero artificial or processed junk. I stick to ingredients that benefit the body, while satisfying cravings. When I have a serving after dinner on a Wednesday, I truly enjoy each bite and feel good about my choice. And I do the same the following day. It is possible to have your cake, and enjoy it too. Nutrition during the holidays can be tough, and proper nutrition after the holidays can seem impossible. I'm ere to assure you that you're not alone and we can work together to find what works best for you. For a free initial consultation, simply fill out a contact form here and make this your best, healthiest, and happiest holiday season yet! Preheat the oven to 375 degrees and thoroughly grease or line a 9x9 baking dish. 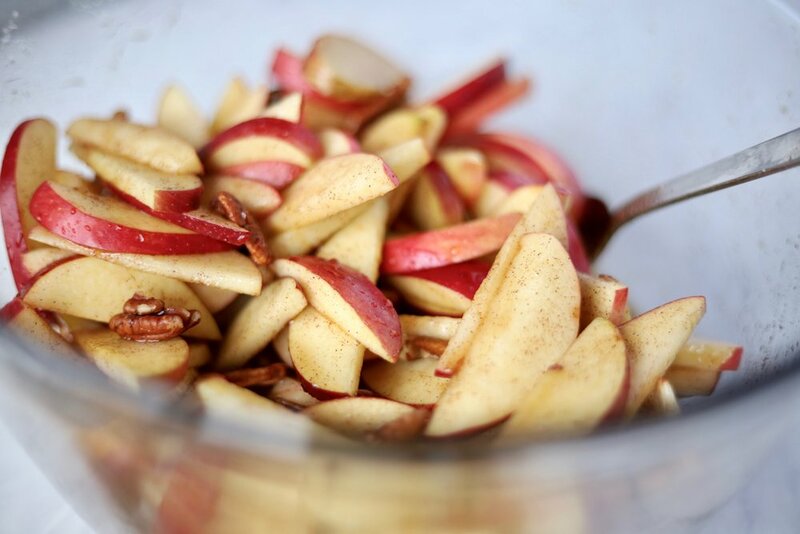 To begin, carefully slice 5-6 medium apples and place in a large mixing bowl. I typically use gala or granny smith for baking, but any apple you have on hand will do. Peeling the apple is optional and based on preference. 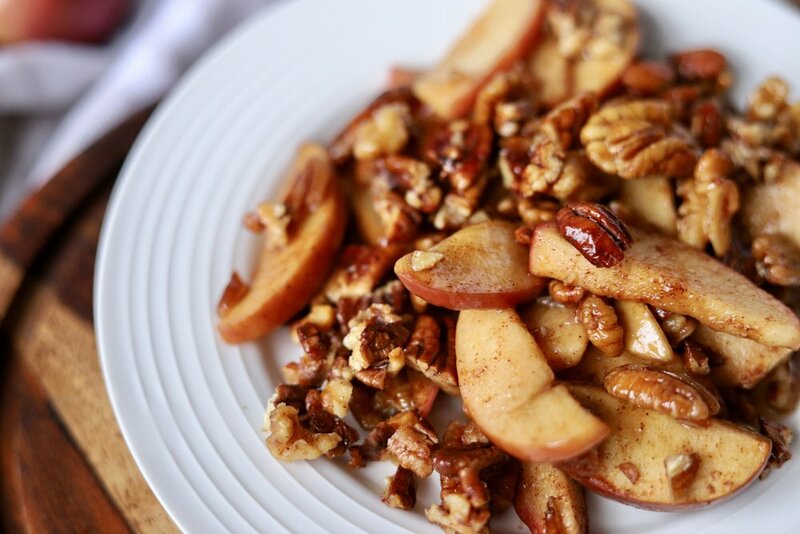 Once the apple are cut, add lemon juice, maple syrup, cinnamon, maple syrup and pecans. Mix well until fully incorporated. Add cubes of butter and set aside, or in the fridge, to begin the crumble. 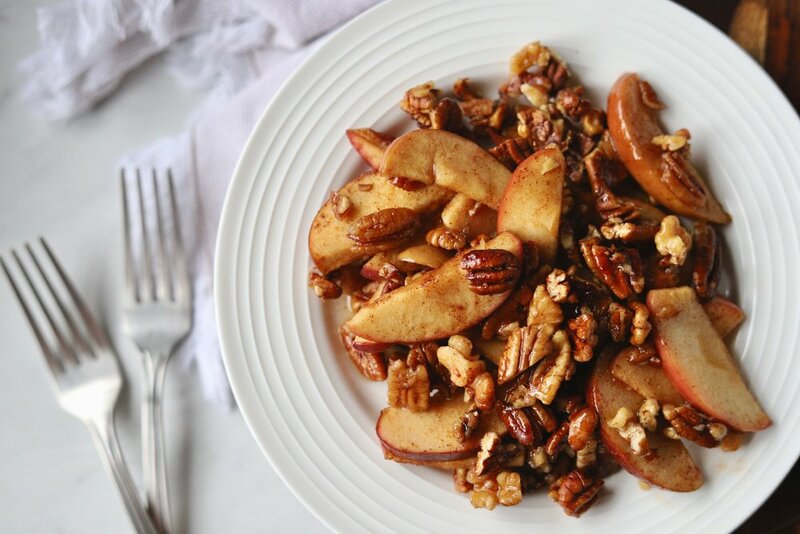 In a separate mixing bowl, combine the pecans, cinnamon, butter, and sea salt to create the crumble. 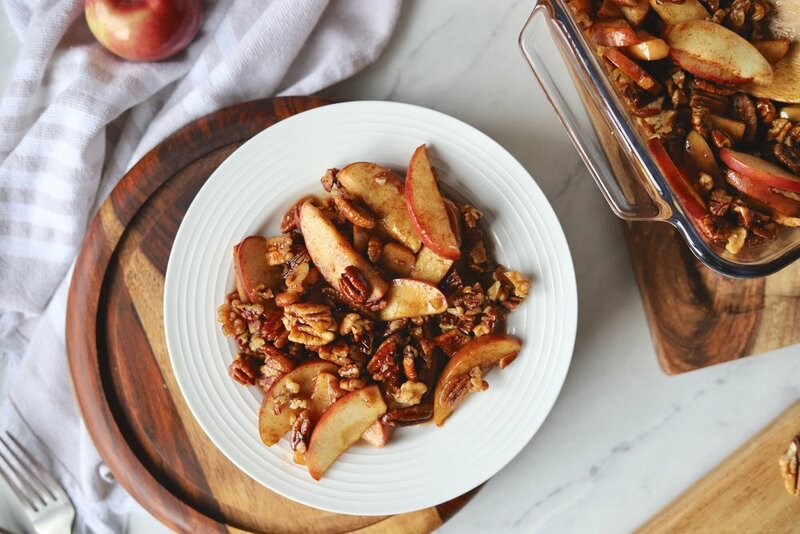 Once your filling and crumble is ready, carefully pour the apple filling into the baking dish and cover evenly with the maple pecan topping. Cover with tin-foil and bake for 20 minutes at 375 degrees. After the first 20 minutes, uncover the dish and allow to bake for an additional 10-15 minutes. This will allow the topping to crisp without burning. Remove from the oven and let the apples cool slightly before serving. You can serve this warm with a scoop of vanilla ice cream for a delicious and healthy dessert or cold with your favorite cup of hot tea or coffee for breakfast. I hope you love this recipe as much as we do!